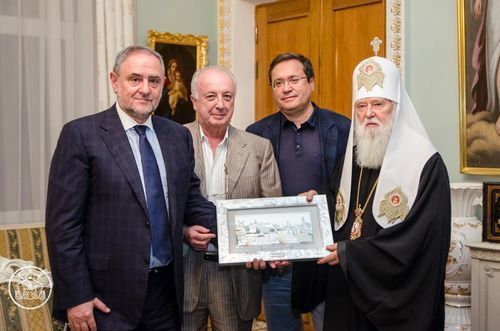 World Jewish Congress (WJC) Chief Executive Officer Robert Singer and Ukrainian WJC Vice Presidents Andrey Adamovsky and Boris Fuchsmann on Wednesday met with Patriarch Filaret, the head of the Ukraine Orthodox Church – Kiev Patriarchate, the leading Orthodox Christian denomination in Ukraine. Singer relayed the warmest personal regards from WJC President Ronald S. Lauder, recalling their prior meeting in New York City, as well as praising the excellent relations between the church, which covers 40 percent of Ukraine’s population, and the Jewish community. Patriarch Filaret also highlighted the good relations of Ukraine's religious communities, specifically between the Jewish community and his church. He said this relationship was something "not every country can boast of," calling for good interfaith "relations to persist and spread throughout the region and world." He issued a strong condemnation of anti-Semitism, saying "the Ukraine Orthodox Church is not interested in anti-Semitism" and stated unequivocally that "a good Christian cannot be an anti-Semite as a good Christian must love everyone." The Patriarch and the WJC delegation discussed the importance of equal rights for all religious communities and furthering the already strong connections between Ukraine Orthodox Christians and Jews, particularly in North America. The WJC delegation and Filaret agreed to work to bring together the Ukrainian Orthodox diaspora and the Jewish diaspora in the United States and Canada.